Messaging is now about more than just texting, video has shown testimony to that. Even our local favourite chat platform WhatsApp is hugely popular for letting users share videos, something made easier by bundled services that spare any cost concern. To that end a lot of providers keen on maintaining relevance in that market are reaching for the latest buzz, disappearing video messages. Disappearing videos might not be a popular service in markets where other IM apps like WhatsApp and WeChat have gained a strong market share(Think India, the rest of Asia as well as Africa) but its increasing relevance in mature markets like the US has meant that giants like Facebook have taken notice and want in. Enter Skype with its new standalone app, Skype Qik. Launched yesterday, this new video messaging service is a result of Skype’s 2011 acquisition of another video message service, Qik. The app’s functionality is pretty straight forward; it allows users to send short video messages (up to 42 seconds long) to contacts. It looks like in a big way Microsoft, which owns Skype, wants to establish a foothold in mobile, with the messaging route looking like a smart entry thanks to Skype’s comfortable placement in that domain. Although its part of the Skype imprint a user does not need a Skype account to access it. Simply download it (Its available for Android, iOS and Windows Phone) and get to Skype Qik with other users. Considering Skype’s popularity as the work environment chat platform all these functions sound fairly trivial. After all, the disappearing message sensation associated with Snapchat, Glide and now this Skype Qik has been associated with the younger demographic that wants to run away from a Facebook that is “no longer cool”. But if companies like Google and Facebook want to bet billions on this “teen obsession” it could be worth considering as the future draw card for messaging or at least a prerequisite. Maybe developers and startups can start exploring a smarter option for the local market? 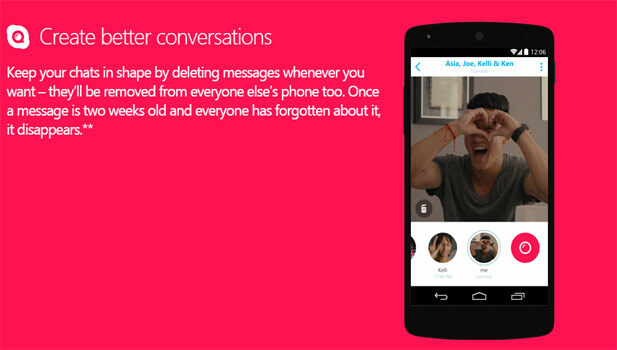 Are you interested in Skype Qik and have you used any of these other video messaging apps? Please share your thoughts in the comments below.